It’s unlikely a child with unhealthy teeth and serious cavities will have fun at their first dental visit. Cavities are difficult to treat in young mouths and most dentists suggest sedation or general anesthesia – a scary experience for everyone. Taking toddlers to the dentist is suggested by the ADA as an opportunity for the dentist to teach you how to prevent cavities in your children’s teeth. Remember a dentist cannot prevent a cavity – he or she can only explain how a cavity forms and give you advice how to prevent them. Dentists can warn you about soft areas, plaque and diet, but in many cases these appointments are too late for prevention –cavities may have already formed. A child with healthy teeth usually has a wonderful first dental experience – marked by praise, fun, and celebration! The most effective way to protect baby teeth from cavities is with xylitol and the easiest time to prevent a cavity is before, or when, baby teeth erupt. If you are a regular visitor to this site, you already know this – so perhaps you can help other parents learn the truth. Cavity bacteria can be eradicated from parents’ mouths through the regular use of xylitol and in this way the transmission of cavity-germs to their baby can be prevented. This advice is so practical and useful – I wonder if OB-GYN teams should be explaining how to prevent cavities in baby teeth at a time when parents haven’t even considered the dental health of their unborn baby. Parents can clean baby’s mouth at home using a solution of xylitol made with 1/8th teaspoon of xylitol crystals dissolved in 1 oz water. Wipe this over the gums and teeth in a baby’s mouth, especially as baby teeth erupt. When the baby grows, this solution can be brushed onto teeth and used in place of toothpaste. Zellie Bears are soft and dissolve quickly for a toddler treat, or you can give xylitol crystals from a spoon or in a drink of water. The secret is to have enough xylitol every day to prevent plaque and cavities. Studies show that children with healthy teeth at 4 years old are more likely to have healthier teeth for life, and that children who eat xylitol have almost 50% less ear infections. Evidence Based studies show that frequent use of small amounts of xylitol inactivates cavity bacteria and makes them slippery, unable to attach to teeth. Parents and adults should strive for at least 5 exposures every day, with 1-2 grams of xylitol at each exposure. A child with healthy teeth should be in and out in no time – and hopefully the dentist will offer praise and give a small gift or token as they exit. 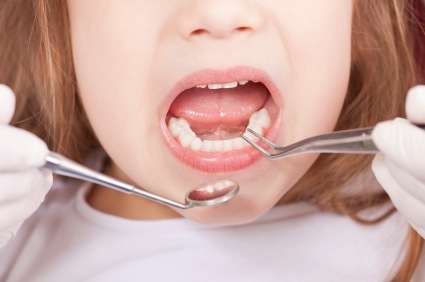 If the visit is a disaster don’t blame your child: wait a few months or try another dentist. Annual visits should be adequate in early years, unless you have concerns about a particular tooth. Avoid cleanings, unless they are deemed necessary. There is no science to show a dental cleaning has any benefit for a child’s oral health – and it may upset the mouth flora or abrade enamel. Avoid X rays unless they are necessary. It is unlikely a toddler will need an X ray if they have healthy teeth.